Robonaut 2 launched up to the ISS on February 24th, 2011, fulfilling a 15 year dream to put a humanoid robot into space. NASA JSC has developed a series of Centaur rovers to carry the Robonaut upper bodies and other payloads. Researchers at NASA's Johnson Space Center (JSC), in collaboration with General Motors and Oceaneering, have designed a state-of-the-art, highly dexterous, humanoid robot: Robonaut 2 (R2). R2 is made up of multiple component technologies and systems -- vision systems, image recognition systems, sensor integrations, tendon hands, control algorithms, and much more. 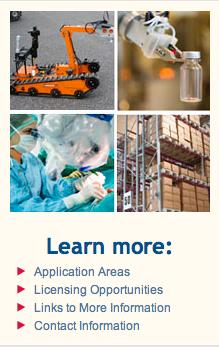 R2's nearly 50 patented and patent-pending technologies have the potential to be game-changers in multiple industries, including logistics and distribution, medical and industrial robotics, and beyond. 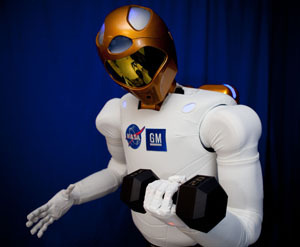 A Robonaut is a dexterous humanoid robot built and designed at NASA Johnson Space Center in Houston, Texas. Our challenge is to build machines that can help humans work and explore in space. Working side by side with humans, or going where the risks are too great for people, Robonauts will expand our ability for construction and discovery. Central to that effort is a capability we call dexterous manipulation, embodied by an ability to use one's hand to do work, and our challenge has been to build machines with dexterity that exceeds that of a suited astronaut. 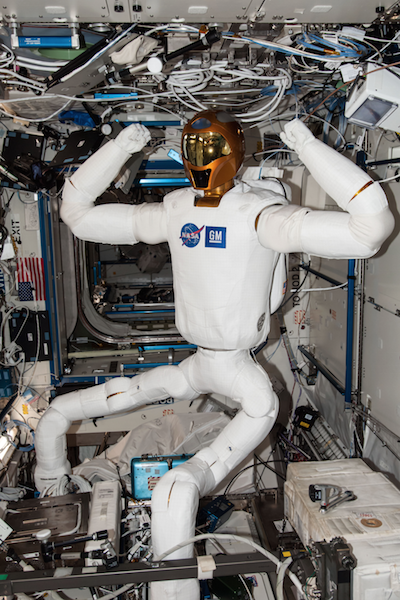 The Robonaut project has been conducting research in robotics technology on board the International Space Station (ISS) since 2012 (more on R2 in the ISS). Recently, the original upper body humanoid robot was upgraded by the addition of two climbing manipulators ("legs"), more capable processors, and new sensors. While Robonaut 2 (R2) has been working through checkout exercises on orbit following the upgrade, technology development on the ground has continued to advance. Through the Active Reduced Gravity Offload System (ARGOS), the Robonaut team has been able to develop technologies that will enable full operation of the robotic testbed on orbit using similar robots located at the Johnson Space Center. Once these technologies have been vetted in this way, they will be implemented and tested on the R2 unit on board the ISS. The goal of this work is to create a fully-featured robotics research platform on board the ISS to increase the technology readiness level of technologies that will aid in future exploration missions. Another way this might be beneficial is during a robotic precursor mission. R2 would bring one set of tools for the precursor mission, such as setup and geologic investigation. Not only does this improve efficiency in the types of tools, but also removes the need for specialized robotic connectors. Future missions could then supply a new set of tools and use the existing tools already on location. R2 was designed and developed by NASA and General Motors with assistance from Oceaneering Space Systems engineers to accelerate development of the next generation of robots and related technologies for use in the automotive and aerospace industries. R2 is a state of the art highly dexterous anthropomorphic robot. Like its predecessor Robonaut 1 (R1), R2 is capable of handling a wide range of EVA tools and interfaces, but R2 is a significant advancement over its predecessor. R2 is capable of speeds more than four times faster than R1, is more compact, is more dexterous, and includes a deeper and wider range of sensing. Advanced technology spans the entire R2 system and includes: optimized overlapping dual arm dexterous workspace, series elastic joint technology, extended finger and thumb travel, miniaturized 6-axis load cells, redundant force sensing, ultra-high speed joint controllers, extreme neck travel, and high resolution camera and IR systems. The project is led by the Robotics Systems Technology Branch in the Software Robotics and Simulation Division at Johnson Space Center's Engineering Directorate. 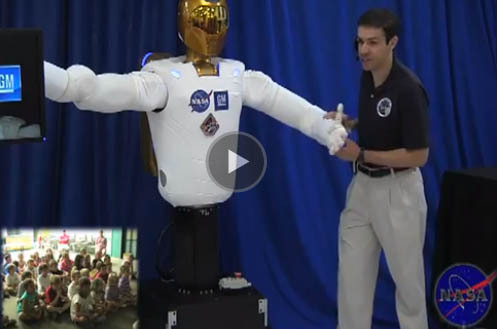 For Education focused information about Robonaut and robotics in general go to NASA Education Robotics page. Watch Dr. Ron Diftler and Dr. Julia Badger give a live demonstration of Robonaut 2 to a group of students at the Good Samaritan Institute.